A standard installation includes a base station and multiple antennas to cover a fixed area, and the P2P option is designed to augment this setup, enabling line-of-sight communication between personnel working beyond the range of the antennas in locations such as engine rooms or machinery spaces. As the P2P headsets employ only low-level infra-red digital encoding technology, they are completely immune to radio, radar and electrical noise and have no effect on sensitive electronic equipment, flammable atmospheres or munitions. In addition, they carry a Class 1 product designation as defined by the EN 60825-1 standard, which means that they present no ocular or other health hazard to users. To establish the P2P link, the first mobile operator simply latches the PTT button on the control pad and starts speaking. On hearing the transmission, the second operator presses PTT and latches the channel open between the two users. No further operations are needed until the conversation is complete and either user presses PTT again. When the mobile operators return to an area covered by an Azdec antenna, the headsets automatically revert to standard configuration with full system functionality. Peer-to-peer headsets are available in standard and high noise attenuating versions and can be specified with either lightweight or standard battery packs. For further information on P2P or any other of our system options email or call; see 'conntact us'. 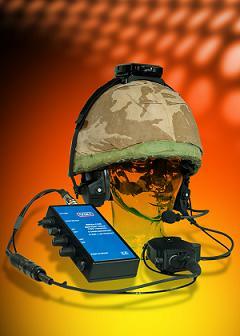 New to our range of headset options is a battle-helmet headset that offers active noise reduction. Designed to ensure that clear audio communication is maintained in even the noisiest of environments, the new headset is particularly suitable for naval ‘force protection’ personnel stationed on a ship’s bridge wings and can also be used wherever an Azdec system is deployed on land. Providing totally secure, short-range voice communications using infra-red signals, Azdec systems enable personnel to roam freely from their base positions, unhindered by any trailing wires. There are no RF emissions and the infra-red signals cannot be detected by any conventional method, so it is impossible for anyone to eavesdrop on what is being said. The new headset incorporates an Azdec transceiver employing low-level infra-red digital encoding technology, together with noise-cancelling circuitry to eliminate any disruptive background noise. Compatible with a variety of helmets, the headset combines rugged construction with a comfortable, ergonomic design featuring dual-seal foam ear cushions, adjustable nylon straps, a padded stainless-steel napeband, an easy-to-position boom microphone, control module and rechargeable battery pack. There is no need to remove the helmet when putting on the headset or taking it off, and both the boom microphone assembly and the ear cushions can be replaced in the field. As the headset only transmits very low power infra-red signals, it carries a Class 1 product designation as defined by the EN 60825-1 standard, which means that it presents no ocular or other health hazard to users. Around the core technology of the system we have a number of different options that can be employed but if you don’t see what you want please contact us for further information.